I typically review applications that relate to my scientific, engineering, and astronomy background. However, after using this OS X application and its mobile companion iOS application Tracker2Go (US$2.99) for the past couple of months, I realized I should review, rate, and share this with you. Just after the Christmas holiday I had my annual Medicare checkup. I mentioned to my doctor that I’ve managed to lose a reasonable amount of weight since retiring back in 2002 but for the past year or so I seem to be stuck at current weight, which is well over what is recommended for my physical profile. Ideally, I would need to drop another 50 pounds from the 30 I had lost since retiring. After discussing what my daily exercise and activities are, including eating, snacking and drinking, my doctor scheduled me for a six month followup visit and requested I bring in a food diary covering the last couple of weeks before my return visit. Not really knowing what a food diary is, she explained I simply needed to log everything I had eaten during that period. Walking home from my doctor’s office and pondering how to keep a food diary, I thought, almost out loud, there must be an app for that. 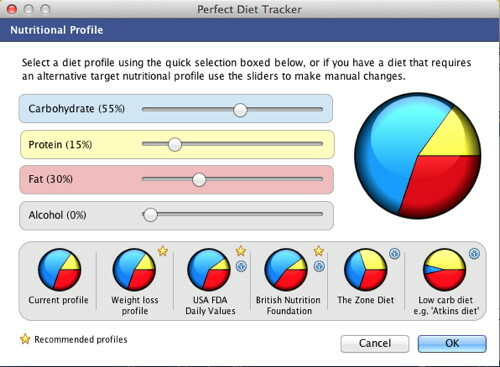 Sure enough, visiting the Apple App Store on my iMac I found Perfect Diet Tracker and information about its mobile companion iOS app, Tracker2Go. Although similar, the higher priced OS X application provides more features than the lower priced mobile companion iOS application. 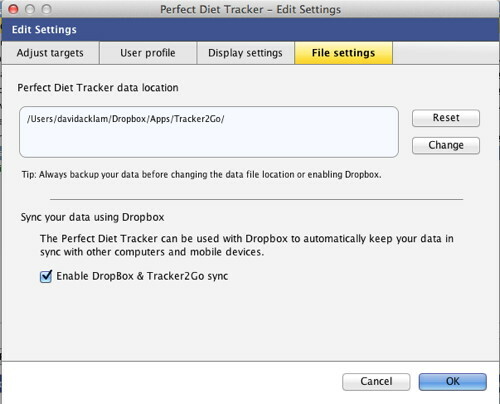 The high price made me hesitate at first but after reading through the details of the OS X application and visiting the tutorials at the Perfect Diet Data website, I decided it was worth giving it a try. After installing the OS X application on my iMac and exploring the features and functions it became obvious I should also go ahead and purchase the mobile iOS app too. You could simply use just the OS X application but I find the mobile iOS app is so convenient when dining out. The application comes with a good built in database but you have the option to enable an internet search feature which gives you an additional 45,000 plus listings of food products. It is a smart search option that is used only when the application can see your internet connection. 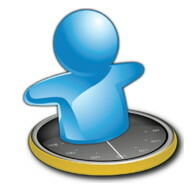 The application will simply continue to use the internal data base when there is not an internet connection. Once you initially start the application one needs to fill in some profile information. These settings are straightforward and assist you in tuning your weight loss plan. 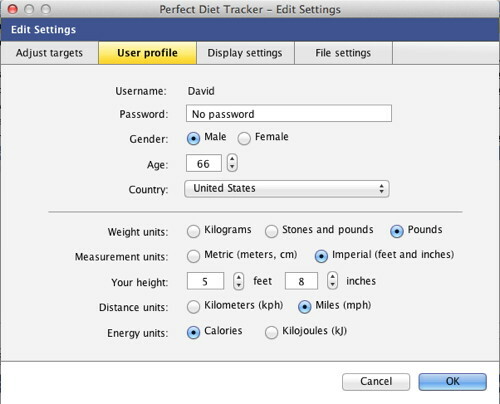 After filling in details which include your name, and optional password, your country, age, gender and preferred units, you are asked to fill in your height, and current weight. At this point, you will learn, as I did, where you stand regarding your Body Mass Index (BMI) and the range you are as to being underweight, normal weight, overweight, all the way up to obese category III. Unfortunately, I checked in on the first of the new year, at obese category 1, with a BMI of 32.4. I’ve never really been very good at dieting and thus have had my ups and downs with my weight for years. I’ve always been told it is simply a math problem of calories in versus calories out. Keeping track of those calories can be a real problem for me and probably most other people. What I see in Perfect Diet Tracker, is a straightforward method of logging in those calories and learning what your eating and exercise habits contribute to the overall equation. With my technical background, I use spreadsheets for many applications. 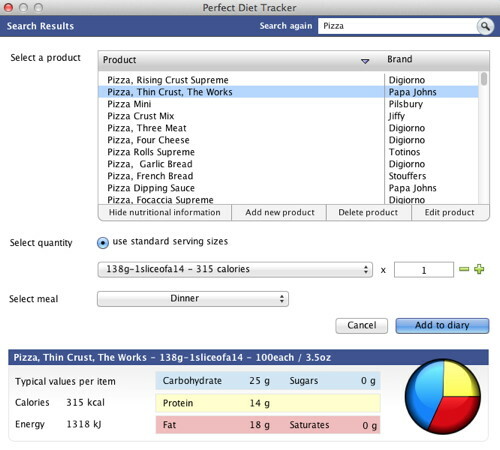 I probably could have built a spreadsheet to support my diet entries but I didn’t. If you are comfortable with making regular entries into spreadsheets, then I’m sure you will be right at home with Perfect Diet Tracker. 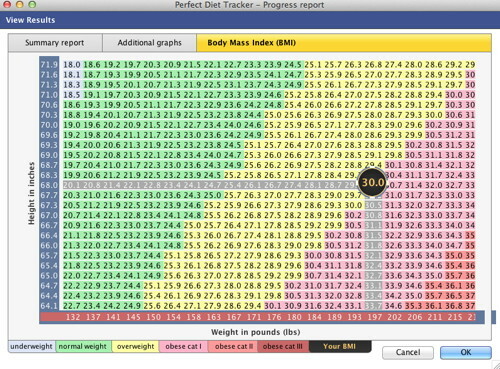 There are tutorials and excellent screen shots available at the Perfect Diet Tracker website, but let me just share some of mine so you can follow the progress I have achieved over the past couple of months. 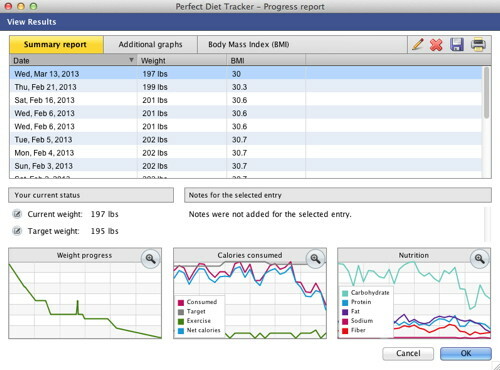 Figure 1 illustrates my current profile entries but not my initial weight. This will show up in a results illustration later. I’m currently working a target weight of 195 pounds by April 9th setting a target line of four pounds over five weeks. As a senior, doing regular community outreach events, I estimated that I am moderately active. This setting is illustrated in figure 2. Figure 3 simply illustrates fields that I want displayed in my daily entry log. I find that these fields really help me better understand what I am consuming besides just the calories. As I mentioned earlier, I purchased Tracker2Go for my iOS devices: an iPad generation 3, iPod touch generation 4, and my iPod touch generation 5. I also use DropBox. In my file setting, figure 4, I have enable the sync function which allows each device to share my entries and be kept in sync. My daily log entry on the morning of March 6 is shown in figure 5. This is what I’m greeted with at the beginning of my day just after breakfast. As you can see, it is very similar to a spreadsheet that one simply needs to fill in the details. The pie charts located along the bottom of the previous illustration can be changed by the user. Figure 6 shows what I have elected to start with. I am using the weight profile that was provided in my initial setup. The application allows one to even make manual changes as may be necessary according to your doctor’s recommendations. Now for some of the results. Figure 7 illustrates my progress since the beginning of the year and allows me to view this progress in separate charts for weight, calories and nutrition. You can see my BMI progress has been going in the right direction too. Each of the charts can be expanded separately for closer scrutiny when desired. As one can see in figure 8, I still have a long way to go to reach normal weight and Body Mass Index. But at present, I’m heading in the right direction. My goal is to be in the 180 range when I return to my doctor this summer for my followup visit so I still have a lot of work to do. Data entry is really very easy when what you are eating is already located in the internal or on-line data base. For example, if we are planning to order a pizza from Papa John’s, I can enter Pizza in the search window as illustrated in Figure 9 and then select the specific Papa John’s pizza. I can easily see what the consequences are going to be if I plan to eat just one or maybe several slices of the Thin Crust, The Works pizza. For me, this really gives the instant feedback I need to help better plan what I am gong to include in the specific meal and my overall daily meals. I’m forever amazed how fast the carbs and fats grow and how little protein seems to be there. Last, if you are unable to locate the Brand and Product of what you are including in your meal, you can add a new product as illustrated in figure 10. I’ve become very consistent in verifying product nutritional information on the labels of all of the packaged products I include in my meals. Products seem to change so often that I sometimes find that the database listing does not always agree with something I just purchased. My additions and updates get saved and are available the next time I chose the product in one of my meals. Nutritional information is not always available, especially for meals made from scratch at home or at local restaurants. Not all eateries are required to produce this information. 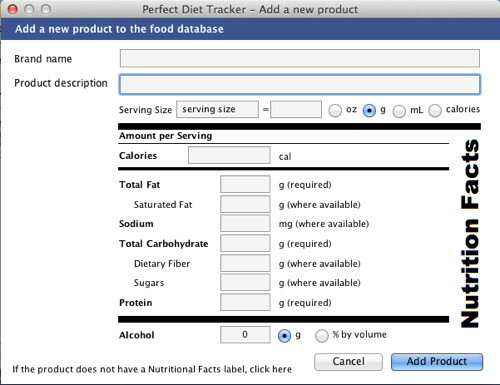 Again, with this feature, it is easy to add this to your database by either modifying an existing product or building the meal, item by item. I like to make large salads so I will start with lettuce, which is in the database, and keep adding the ingredients and vegetables, item by item. I’ve learned that serving sizes are also important, so much that I purchased a kitchen scale. It really is calories in versus calories out and I’m learning to do the math. 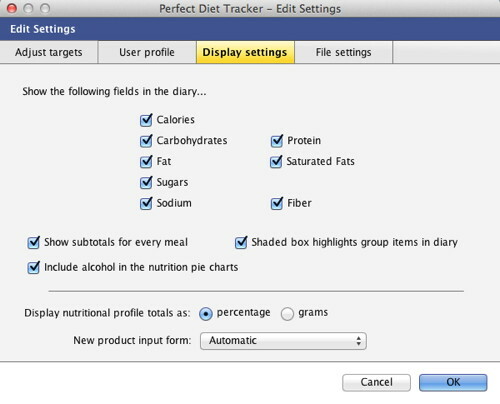 The OS X Perfect Diet Tracker application is well worth the cost. I find the application straightforward and easy to use. The mobile companion and lower priced iOS Tracker2Go application is also worth the cost. As with any diet, weight loss is really up to the individual. For me, this application has been a real asset. The proof is in the results I have achieved to date. Like any diet, it is easy to crash off the pounds only to find you are still hungry and end up sneaking in a few extra snacks and extra portions and your weight loss suddenly turns to weight gain. I like that that I have the constant feedback and graphs that show me how well I’m staying within my plan. It is easy to adjust the slope of my weight loss trajectory and slow down the cut in calories until I am comfortable with my daily meals and snacks. The examples I presented illustrate just a portion of the capabilities of this application. 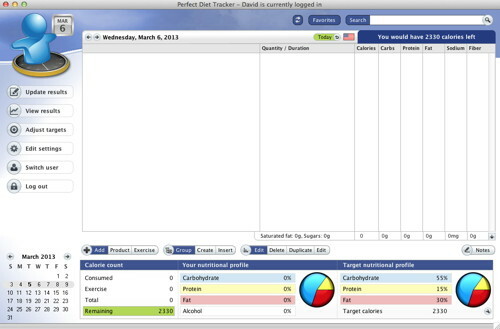 Visit Perfect Diet Tracker to find additional examples and tutorials. The only problems I have run into with the application has been that my targets have been changed on a a couple of occasions. This may have occurred when I made entries from one of my iOS devices. My current weight showed up higher than what I had entered and my target calories had increased. When I tried to correct this I was not always able to accomplish it. Could be something I’m doing incorrectly or a minor glitch or coding error in the application. Not a show stopper in any way. 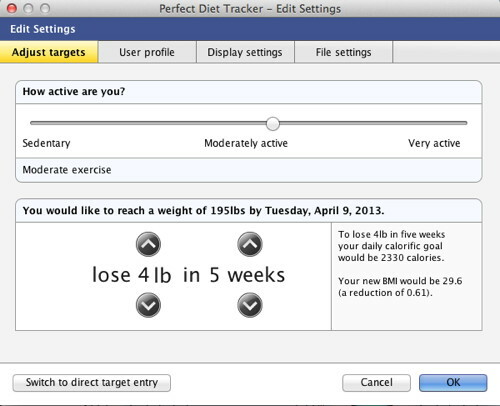 Therefore, I am awarding Perfect Diet Tracker a MyMac.com 9 out of 10 review rating.